Osmosis: Indirect cholinomimetics: Anticholinesterases. (2019, April 24). Retrieved from (https://www.osmosis.org/learn/Indirect_cholinomimetics:_Anticholinesterases). Edrophonium (trade name Tensilon) is a readily reversible acetylcholinesterase inhibitor. It prevents breakdown of the neurotransmitter acetylcholine and acts by competitively inhibiting the enzyme acetylcholinesterase, mainly at the neuromuscular junction. Neostigmine (Prostigmin, Vagostigmin) is a parasympathomimetic compound that acts as a reversible acetylcholinesterase inhibitor. 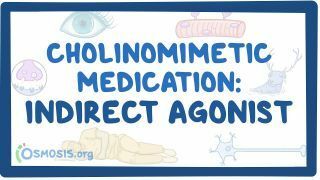 Given that it is a quaternary amine (unlike physostigmine, which is a tertiary amine), it penetrates the central nervous system poorly and has lower propensity to cause side effects there. Pyridostigmine is a parasympathomimetic and a reversible cholinesterase inhibitor. Since it is a quaternary amine, it is poorly absorbed in the gut and cannot penetrate across the blood–brain barrier. Donepezil, marketed under the trade name Aricept, is a medication used in the palliative treatment of Alzheimer's disease. Donepezil is used to improve cognition and behavior of people with Alzheimer's, but does not slow the progression of or cure the disease. Galantamine (Nivalin, Razadyne, Reminyl, Lycoremine) is used for the treatment of mild to moderate Alzheimer's disease and various other memory impairments, in particular those of vascular origin. It is an alkaloid that is obtained synthetically or from the bulbs and flowers of Galanthus caucasicus. Rivastigmine (trade name Exelon) is a parasympathomimetic or cholinergic agent for the treatment of mild to moderate dementia of the Alzheimer's type and dementia due to Parkinson's disease. The drug can be administered orally or via a transdermal patch; the latter form reduces the prevalence of side effects, which typically include nausea and vomiting. The drug is eliminated through the urine, and appears to have relatively few drug-drug interactions. What class of drugs is useful for treating the cognitive impairment in Alzheimer's Disease? A 37 year old female is undergoing a laproscopic cholecystectomy. The anesthetic plan is general anesthesia with sevoflurane and a neuromuscular blockade (NMB) with rocuronium. Towards the end of the case a reversal agent for the neuromuscular block is given. Which of the statements regarding neuromuscular block reversal is true?